Finally good guided meditation scripts for kids! Even if meditation is of great benefits for children, it remains a practice that most of the time requires discipline and efforts. On the contrary to the above, this guided-series offers an immersive superhero universe so that children can enjoy every moment of their journey to discover their superpower. The main technique used in this book consists of amusing and deep visualizations that foster kids’ imagination and implication. Yet the images that are used are very simple and easy to remember, so children can use the techniques they have learned at any moment they deem it necessary. Kids may even encounter sweet characters along the way and ask you to come up with other sessions of meditation for them so they can meet these characters again! 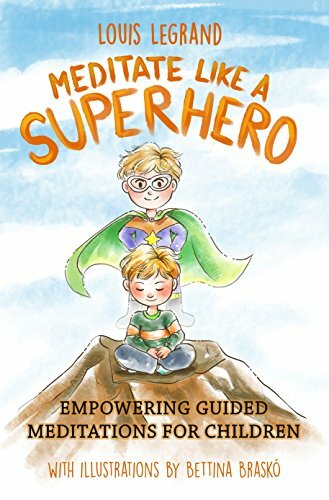 This book is supercharged with no less than 16 sessions that cover a wide range of topics related to the well-being of children. You’ll be able to teach kids positive energy techniques based on deep breathing, body scan, mindful eating or even active listening. Ways to cope with negative feelings such as fear and loneliness will be presented, as well as practices that enhance empowering feelings like confidence, energy, gratitude, love, patience, and creativity. This book is particularly aimed at parents and educators who aren’t new to mindful practices but struggle to find entertaining and transformative scripts to guide kids through such practices. However, if you have never meditated yet, this book will still be a good choice for you to discover mindful activities to experience with your kids and to introduce them to reading that can have a tremendously positive impact on them. The written material offers a great flexibility in terms of length, rhythm and tone. By listening to your voice, kids will get to know new parts of your personality, your history and what makes you unique. It is therefore a perfect way to build long lasting bonds with your children or the kids you work with.